KENNEDY SPACE CENTER, Fla. — These days, when one hears the acronym BFF, they think “Best Friends Forever”. However, the words “Booster Fabrication Facility” likely do not top that list. When it comes to NASA’s 2018 Exploration Mission 1, both might apply. The BFF, formerly known as the Assembly and Refurbishment Facility or “ARF”, was one of the structures that supported NASA’s Space Shuttle Program since the mid-1980s. The building was used to prepare the four-segment solid rocket motors for reuse after they had helped loft one of NASA’s orbiters to space during the program’s 30-year run. Since roughly 2004, NASA has had a new target in its sights – beyond-Earth Orbit or “BEO”. Given that the U.S. space agency hasn’t sent anyone beyond low-Earth (LEO) orbit in almost a half century, the agency has opted to use assets and technologies that were readily available and that they were familiar with. That included the use of the associated infrastructure and facilities. After much political wrangling, it was also decided that the new super heavy-lift Space Launch System (SLS) rocket would use a five-segment version of the SRBs that were used on the Space Shuttle. 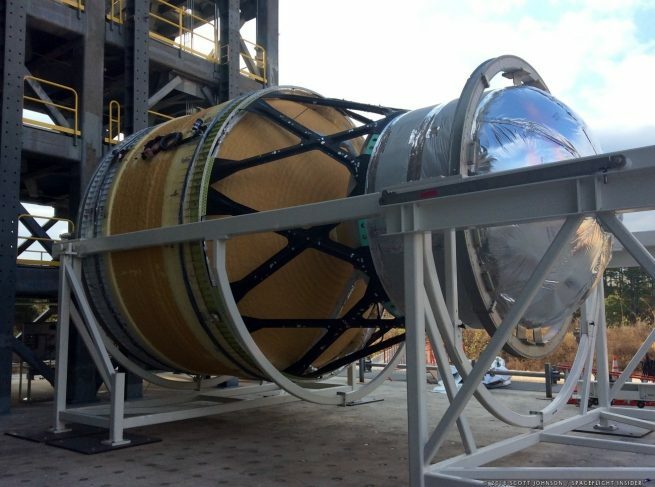 The Block I version of the SLS that will be used for EM-1 will sport two of these new boosters and is designed to have the capability to hoist an estimated 70 metric tons (77 tons) to LEO. When fully-assembled, SLS Block I will stand an imposing 322 feet (98 meters) in height and weigh some 5.75 million pounds (2,608 metric tons) when fully fueled. Some 8.8 million lbf (39.1 MN) of thrust will be unleashed at liftoff. This is 15 percent more than the Saturn V Moon rockets delivered during the Apollo era. EM-1 will be a cislunar mission – one where the SLS will send the second Orion spacecraft ever launched out of Earth’s atmosphere and on toward a journey around the Moon. 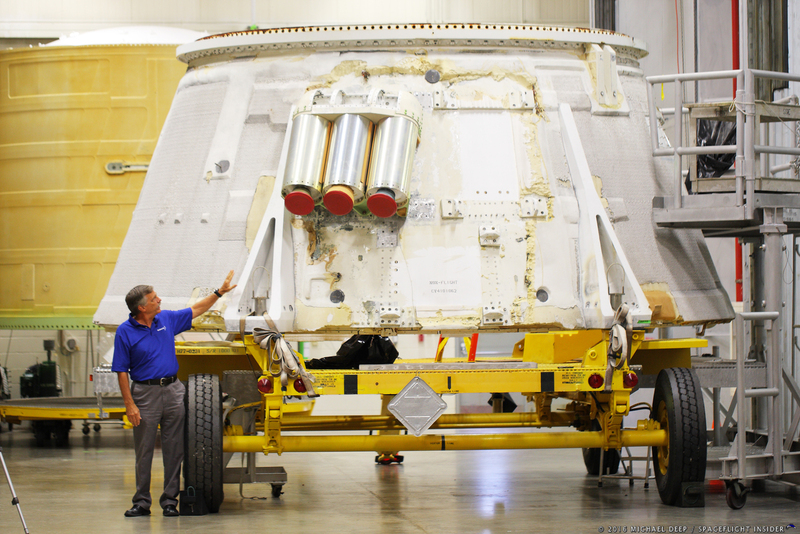 Orbital ATK, the manufacturer of these boosters, has been busy getting the EM-1 boosters ready to support EM-1. Combined, they will each provide an estimated 3.6 million lbf (16 MN) of thrust (7.2 million lbf (32 MN) in total – some 75 percent of the thrust that is generated at lift off). The boosters should burn for approximately two minutes before they are jettisoned. The last time that a booster of this type flew was on the Ares I-X mission, which launched on Oct. 28, 2009, from Kennedy Space Center’s Launch Complex 39B (the last time the historic site supported a flight). “That was the flight of a booster in what we called the ‘single-stick’ configuration,” Larry Clark, Orbital ATK’s Director of KSC Engineering told SpaceFlight Insider. Rather than allow the hard work carried out on the Constellation Program to go to waste (some six years and an estimated $9 billion had already been invested in Constellation prior to its cancellation by President Barack Obama), the Ares I and Ares V vehicle designs are incorporated into the SLS rocket to be usable for both crew and cargo, similar to the proposed Ares IV. EM-1 will be the first time that the full “stack” of the SLS and Orion spacecraft are launched together (an Orion was flown in 2014 atop a United Launch Alliance Delta IV Heavy rocket). Upon reaching LEO, Orion will deploy its solar arrays, but it will still rely on part of SLS’ upper stage – also known as the Interim Cryogenic Propulsion Stage or “ICPS” – to propel Orion on its way to the Moon. On the way to our nearest celestial neighbor, having received the push it needed, Orion will detach from the ICPS. However, even with Orion gone, the ICPS’ mission won’t be finished. It will still have to deploy 13 CubeSats which will then carry out research or serve to demonstrate technologies. Orion is also being developed and produced with an eye not only on cost but partnerships as well. Orion’s Service Module was not produced by one of NASA’s contractors. Rather, it was made by one of the partners working on the International Space Station – the European Space Agency. The Service Module is what will supply the EM-1 Orion with its power and main propulsion system. The average distance between the Earth and the Moon is some 238,900 miles (384,472 km), making the voyage to lunar space one lasting several days. This provides engineers back on Earth with an opportunity to review how well Orion’s systems are handling its deep space excursion. If everything goes as it is currently planned, the EM-1 Orion should soar approximately 62 miles (100 km) above the surface of the Moon. The spacecraft will then use the natural satellite’s gravitational field to “fling” Orion into a new deep retrograde orbit of some 40,000 miles (70,000 km). The EM-1 Orion will then conduct a trans-Earth injection burn – placing it on the path to return home. During its efforts to fly back to Earth, Orion will conduct a close pass of the Moon (a mere 60 miles or 96 km above the lunar surface). At this point, the Service Module will once again be put to the test as it will be tasked with carrying out an engine firing that will assist Orion’s return to Earth. When all is said and done, it is hoped that Orion will re-enter Earth’s atmosphere at a scorching 25,000 mph (11 kilometers per second). During the 2014 EFT-1 mission, the Orion capsule encountered re-entry temperatures of approximately 4,000 °F (2,200 °C). For EM-1, those temps are set to rise significantly, with it being estimated that the heat shield could see temperatures of 5,000 °F (2,760 °C). Like EFT-1 and NASA’s deep space missions of the ’60s and ’70s, it is planned to have Orion splashdown in the Pacific Ocean off the coast of San Diego. I’m 55. I saw a rocket fly to and land people on the moon several times when I was a child, beginning in 1969. All this expense and fuss is just to make an orbit around the moon and achieve capsule reentry!? Hopefully competition within the space launch industry will push things along faster – NASA seems stuck in the past.